One again, I have way too many goodies to keep to myself, so I need to share them before they get stale. In blogger jargon, that mea ns that I have a huge pile of things that I would LOVE to write about, but I just don’t have time. Treat #1: Photo of my sweet little great-nephew (or is it grand-nephew?) Alex, in his Halloween costume. Gotta love those dimples! Treat #2: Planting Memories of her Dad across the City - This is a beautifully written piece about what sounds like a wonderful man, and his daughter, Sandy. Since her father passed away in May, Sandy has planted over 2800 bulbs throughout DC in his memory. One of my personal mottoes is "Life is your garden. Plant something good." It sounds like both Ted and Sandy have done their part to "plant something good." Treat #3: Here’s another great article. This one, entitled Fall Leaves are Nature’s Free Gift to Homeowners, reminds us of the value of mulching and composting our fall leaves to keep all of those great, natural nutrients in our landscapes. Treat #5: Want to conserve more energy? There’s an app for that. New Facebook App the 'Farmville' of Energy Conservation? The app will combine the competitiveness of a game with real-world data. Facebookers can benchmark their home’s energy usage against a national average of similar homes, compare their energy use with friends, enter energy-saving competitions, and share tips on how to become more energy efficient. Treat #6: Exciting news for Virginia – Fort Monroe becomes National Monument - Today is truly an historic day for America as President Obama is announcing the establishment of Fort Monroe National Monument -- a historic fort in Virginia’s Tidewater region that was integral role to the history of slavery, the Civil War, and the U.S. military -- as the 396th unit of the National Park System. Treat #7: Alex again. This time, rooting on his favorite football team! Treat #8: FANTASTIC November to-do list on the Behnke's Garden Blog. 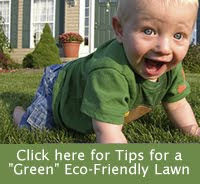 Hints and tips for trees, shrubs, edibles, lawns and so much more. Great job, Susan! Treat #9: ANOTHER cute Halloween baby. My good friend Kathy's new granddaughter, Autumn, dressed like a pink shrimp. Which I'll use as a reminder that eco-friendly gardening helps protect our waterways! I have lots more treats in store, so be sure to subscribe to the Metro DC Lawn and Garden blog. Visit Common Good's rain garden and learn how to design your own as an attractive way to prevent water run-off from polluting our watersheds. Dean Hively, a scientist from the US Geological Survey, will talk about the relevance and importance of diverting water run-off, and plants that thrive in rain gardens. They will have bergamot, liatrus blazing star, blue flag iris, and calamus for sale. This workshop is free, but if you earn more than minimum wage, they are requesting a $25 suggested donation.